Hermosa Beach ‘has everything you want and need,’ Mark Burik says. The city isn’t packed with the usual tourist stops found in the more-famous California destinations, but has a great selection of local bars and restaurants. I thought I was a pretty good beach volleyball player. Sure, I’m no superstar or anything, but I was the captain of my high school volleyball team back in the day (shout out to Maples Collegiate) and like to think I can hold my own with the best of them at Super-Spike every year. But my opinion quickly changed after a recent trip to Hermosa Beach, Calif., and an afternoon training session with Mark Burik — the CEO and head coach of Volleycamp Hermosa. Now before I get into my struggles on the volleyball court, I have to mention my love for Hermosa Beach. Hermosa Beach, I’m sure you can imagine, is a beachfront city. It’s located between Manhattan Beach and Redondo Beach, and is just under an hour drive from downtown Los Angeles. You won’t find many locals making that drive to L.A., though. “It’s typical to do everything you can to not leave (Hermosa Beach),” said Burik, a professional beach volleyball player from New York who made the move to sunny California to take his training to the next level, before ultimately starting Volleycamp Hermosa four years ago. But what I enjoyed the most about Hermosa is that it doesn’t feel super touristy compared to more-famous California destinations like Venice Beach or the Santa Monica Pier. You won’t find dozens of gift shops selling crappy screen-printed muscle shirts or wannabe rap artists following you down the street trying to get you to buy their mixtape in Hermosa. Instead, you can walk along Pier Avenue, which features a great selection of local bars and restaurants, towards The Strand — a path along the beach that’s perfect for a bike ride, a run or a casual stroll — feeling like you found a slice of California paradise that has yet to be discovered by tourists. There’s also a pier that is 1,000 feet long that stretches onto the Pacific Ocean, giving you a perfect view of the small beach town, which has a population of roughly 20,000 people. But anyways, back to the volleyball. 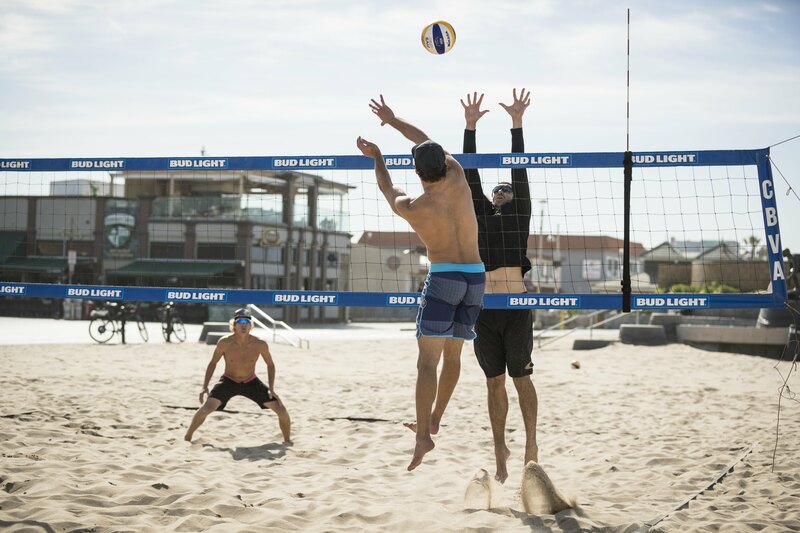 The first thing you’ll notice when you step onto one of the many volleyball courts on Hermosa Beach is the sand. Mark Burik, CEO and head coach of VolleyCamp Hermosa in Hermosa Beach, Calif.
“The sand is what beach volleyball players call deep,” Burik explained, as I watched my feet sink below the surface. And that’s an understatement. That sand made me feel like I was playing in slow motion. So, if you can play on Hermosa Beach, chances are you can play anywhere in the world. It’s a big reason why professional players from all over the world travel to Hermosa to train with Burik — who played indoor volleyball at George Mason University from 2005 to 2008 before playing professionally overseas. Burik, 33, converted to the sand game full time in 2014 and regularly competes on the AVP Tour and FIVB World Tour. Now my group and I were nowhere near professional-level talent, but after an hour session with Burik, where he took us through passing, hitting and serving drills, I can totally see why national team players from places such as Austria, New Zealand and China would make the long trip to work with him. For starters, he has a likable and charismatic personality, which makes shanking balls in cement-like sand under the blistering hot sun somehow a good time. He’s also a very knowledgeable coach, as he can break down exactly what adjustments you need to make to fix your technique, which I experienced first-hand as he helped me get rid of a bad habit I had (which I never noticed before), where I would cross my thumbs when bumping the ball. But VolleyCamp Hermosa isn’t just for elite players, as Burik offers individual classes and seven-day training camps, including accommodations (where you arrive on a Sunday, train for three to four hours a day for a week straight, then leave on the next Sunday), for all skill levels. In fact, many people sign up as a fun way of getting exercise, as playing in the sand sure beats running on a treadmill at a crowded gym. Surprisingly, when Burik first moved out to California, he found it difficult to find people to play with. He’d bring a ball and serve it on an empty court, just hoping that someone would ask him to join a game. It’s what inspired him to start Volleycamp Hermosa, as he wanted to make it easier for people to play together. Now if only he could do something to make it easier to play in that damn sand. For more information on VolleyCamp Hermosa and their pricing, visit volleycamphermosa.com.